My final week of my USA experience saw me travel to Raleigh / Durham in North Carolina. Fortunately Hurricane Florence had passed by and everyone that I saw had escaped any effects. My first stop was to meet up with Inmates to Entrepreneurs (I2E). Jaclyn Parker is the Vice President of Programs and was an excellent point of contact in enabling me to connect with the organisations that I met later in the week. I had the pleasure of spending time with her and Kristin who is responsible for community relations, as well as being able to speak to AJ Ware who is the Co-Chair of the organisation and been involved since its inception back in 2009. I2E have been supporting returning citizens by running community courses over 8 weeks and cover a wide range of topics including sales, marketing, finance and legal requirements. They provide a wide range of videos to provide additional resources to support their program. They currently operate in 4 locations, and I was able to attend a class run in the Durham Rescue Mission that was facilitated by Lawrence Carpenter who is a mentor and has been running a successful cleaning business since 2002. He was able to draw on his considerable business knowledge and experience to make the class a lively and interesting space. I2E support over 100 participants a year with these programs and area looking to expand to the New York area. They had an advert running in the airport terminal so looking to attract a wider audience. My next stop was to meet up with Community Success Initiatives. Their mission is: to help make the world a better place through programs that help individuals and communities be aware of personal growth and “success” principals, inspire others to reach their potential, and help to build vibrant and healthy communities. 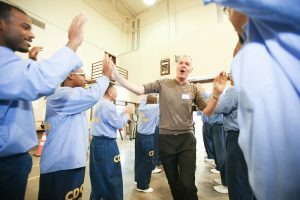 They provide the opportunity for second chances and use the coaching, entrepreneurial training and their network of other re-entry specialists to enable people to move forward with their lives. My last stop in Raleigh was to meet up with Anthony O. Vann and his team at Correction Enterprises. It works within the North Carolina Department for Public Safety and it is a not for profit organisation that provides the opportunity to develop jobs skills for men and women in 30 prisons across North Carolina. 2600 people daily are in their workshops learning valuable skills in 18 different industries that can be utlised upon release. This includes laundries and sewing as well as re upholstery, furniture manufacturing, signage and specialist training such as braille. They receive the standard prison wages for being employed. They also offer propriety products for sale to state employees and organisations (such as cleaning products) that offer competitive pricing due to its buying power from its suppliers. They also offer an apprenticeship pathway as well as running an initiative called PIE. This is where companies can partner with Correction Enterprises and use the talent pool to provide additional capacity when seeking to expand their production output. The employees are paid prevailing wages and get other worker’s compensation coverage. The companies cannot displace their own employees. It is an opportunity to gain a living wage whilst in custody to reduce the financial barriers upon release. There is a first class re-entry team run by Michael S. Lockamy that utilises a network of companies to match candidates with vacancies that lead to a sustainable career. Correction Enterprises is one of the top 3 organisations in the sector in the country has a turnover in excess of $90 Million per annum. It was a privilege to meet such a dedicated team and learn of the work they do. On the way out I was taken to their showroom to see examples of their workmanship. My final meeting was with Tommy Safian, the Founder and Executive Director of Refoundary, based out of the Old Navy Yard in Brooklyn. Refoundary have piloted a 18 month paid fellowship in Los Angeles and New York to develop life skills, financial education and craft skills in a fully supported pathway to a crime free future. 10 businesses to be incubated in LA and NY. 125 people are now employed. One of the incubated business is Cambui Custom Craft. I had the privilege of meeting with Gene, the founder who owns a joinery workshop producing high quality furniture. He has been able to hone his skills and turn them into a means of earning a living. Clearly Gene has been on a tremendous personal journey and I was humbled and privileged to learn of his story first hand and see some examples of quality of his craftsmanship. The success of the program is a credit to Tommy and the drive and passion of the team to provide a high quality and intensive supported re-entry program. It tackles head on the key reasons for recidivism: secure employment, financial literacy and personal development to gain a strong foothold back in society and showcase their value and worth. So, after travelling in excess of 15,000 miles visiting 6 states, 5 different prisons, numerous amazing organisations and people via trains, planes, greyhound buses, subways and a lot of shoe leather it’s done. This experience has been one that will live with me forever. I have been astounded, humbled, excited, informed, inspired and met people that I hope I will be able to develop stronger bonds with, even from afar. People that are willing to grasp a better chance when presented with it will succeed with the unwavering support of these individuals and organisations.